Agatha Christie’s gripping story of justice, passion and betrayal. 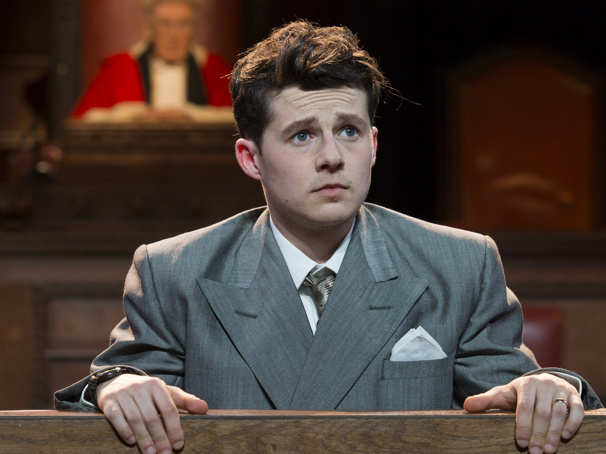 Harry Reid in "Witness for the Prosecution"
Harry Reid spent three and a half years making a name for himself in the popular British TV soap opera EastEnders and now the 25-year-old performer can be seen in the crucial role of Leonard Vole in Witness for the Prosecution, the time-honored Agatha Christie title that continues its hit run at London's County Hall staged within a onetime debating chamber. The charming Reid met Broadway.com backstage late one afternoon to discuss a professional stage debut about which he could scarcely be more excited. Are you surprised to find yourself onstage and in this play? I feel very privileged to have this job and very humbled. I said to my agent that I wanted to do some theater but never imagined anything on this scale. Acting is my love and my passion and I’ve always wanted to explore all aspects of it, and now I can say I’ve done a TV soap and also a professional theater performance. Why was theater so attractive to you? One of the reasons, I think, was the discipline: I wanted to test myself doing eight shows a week, six days a week. When I was in the telly, that was very busy, but I was constantly getting new stuff and new material, so to keep this fresh through November is something that I felt I had to learn as an actor. You learn different performance skills, and I certainly feel a lot looser on stage. What do you make of Leonard, who finds himself arrested for the murder of a wealthy widow? I think he’s a great character and is someone I am growing with and am certainly growing to understand more, if you like. There’s a real sensitivity to him, which I love and that I think audiences may not expect. Have you come up with some sort of back story for him? As I see it, he’s gone and served in the army where he met [his wife] Romaine, who’s very strongminded so for him it was a breath of fresh air to find such a strong, independent woman. At the point we find him in the play, he has been accused of killing a 56-year-old woman while at the same time being completely in awe of his wife and also wanting on some level still to be the strongman. So is he at odds with himself? The thing about Leonard is that he has been through the mill: he has had a difficult childhood, served in the army and for his country and was rarely looked after – and that’s all before we meet him. He’s a complex character, and what actor doesn’t love parts that are complex? Do you think Leonard is guilty or not guilty? I can’t really even go there, but I would say he is not guilty. I mean, who knows, obviously, but, yeah, that’s what I would say. Did you watch the 1957 Billy Wilder film by way of preparation? I did, but it’s very different, as you know. I also watched a BBC TV adaptation. The TV version tends to skirt over certain bits and the ending is completely different, so what I have found is that it’s all in the text; as with most theater, the discovery is in the text. Given that we find Leonard on trial in the play, have you ever yourself had a brush with the law? [Laughs.] You know what, I’ve actually been a very good boy! Listen, we’ve all been young and have done stupid things: I was very much part of the “egging” phase [throwing eggs at property and the like] when I was about 10, so that was 15 or 16 years ago. But I’ve never been in the dock and I haven’t been in a cell—yet. Is it unusual for you in this instance to be younger than the character you are playing [Leonard is 27]? I guess it is, yes. My first job when I came out of drama school was playing a 16-year-old when I was 21, so looking young has tended to help me along the way. The thing with Leonard is that he’s older than I am, but has a boyish charm, so I’ve aged my face with make-up and was very particular about that; I wanted him to look a little bit haggard. Why do you think this production has been such a continued surprise success? There a few factors. First is that the set sells the show: I mean, if you put this production in a normal theater, it would be completely different and nowhere near as good, no matter who was on stage. You mean the fact that you feel as if you are in an actual courtroom? Yes: we’re in a debating chamber, which couldn’t get any more perfect. When I first got the job, I was talking to people about it and they said, “Yeah, I heard about that; it’s got a really cool set.” My friends back at home in Gravesend in Kent have no interest in the theater, but they pay a little bit of attention to it because I’m doing it and they knew about the buzz generated by the atmosphere itself. What about the story itself? I’ve noticed that there aren’t actually that many straight plays in London, and this is certainly one, so for someone like me who isn’t especially interested in musicals the choice is quite limited. Add to that the name value of someone like Agatha [Christie], and you know that you’ve got something guaranteed to get your mind ticking a bit—and that automatically makes the audience feel a bit more alive. This is a period piece but do you feel as if you might like to graduate next to something modern? I’ve got a mate who’s just been in a play called Pity at the Royal Court, and that’s a place I would love to work. But the thing with me is that I love acting and playing different parts to different audiences to different vibes: that’s what I live for.